Mission: Impossible – Ghost Protocol is a 2011 American action spy film directed by Brad Bird and written by Josh Appelbaum and André Nemec. It is the fourth installment in the Mission: Impossible film series, and also Bird's first live-action film. It stars Tom Cruise, who reprises his role of IMF agent Ethan Hunt, alongside Jeremy Renner, Simon Pegg, Paula Patton, Michael Nyqvist, Léa Seydoux and Anil Kapoor. 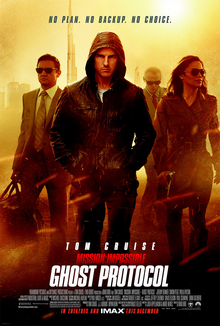 Ghost Protocol was produced by Cruise, J. J. Abrams (the third film's director) and Bryan Burk. It saw the return of editor Paul Hirsch and visual effects supervisor John Knoll from the first film, and is also the first Mission: Impossible film to be partially filmed using IMAX cameras. Released in the United States by Paramount Pictures on December 16, 2011, the film went on to become the highest-grossing film in the series, with $694 million, until it was surpassed by Mission: Impossible – Fallout. It is the fifth highest-grossing film of 2011 as well as the second highest-grossing film starring Cruise. The critical consensus on Rotten Tomatoes calls it "big-budget popcorn entertainment that really works". It was followed by Mission: Impossible – Rogue Nation, which was released in July 2015. IMF agent Trevor Hanaway is killed in Budapest by assassin Sabine Moreau, who takes the file containing Russian nuclear launch codes he had stolen so she can give them to a man known only as "Cobalt". Meanwhile, IMF agent Ethan Hunt has purposely become incarcerated in a Moscow prison to acquire Bogdan, a source of information on Cobalt. With help of Jane Carter, Hanaway's handler, and newly promoted field agent Benji Dunn, Hunt and Bogdan make their escape. IMF tasks Hunt to infiltrate the Kremlin to gain more information on Cobalt. During the mission, an unknown entity broadcasts on the IMF frequency ordering the detonation of a bomb. Hunt's team aborts the mission just as a bomb destroys much of the Kremlin. Carter and Dunn escape, but Hunt is captured by SVR agent Anatoly Sidorov and charged with the destruction of the Kremlin. Hunt escapes and regroups with the IMF Secretary who is in Moscow on other business. The Secretary tells Hunt they have had to initiate "Ghost Protocol", disavowing IMF, but secretly orders Hunt to continue to pursue Cobalt. Sidorov's forces catch up to Hunt, and the Secretary is killed; Hunt escapes along with the Secretary's aide and intelligence analyst William Brandt. Regrouping with Carter and Dunn, Brandt is able to identify Cobalt as Kurt Hendricks, a Swedish-born Russian nuclear strategist, who seeks to start a nuclear war between the U.S. and Russia. Hendricks used the Kremlin bombing to cover up his theft of a Russian nuclear launch-control device, and now is planning a trade with Moreau at the Burj Khalifa in Dubai to gain the required launch codes. The team travels to Dubai. On the 119th floor of the hotel, they create deceptions using their various gadgetry and disguises to make Moreau believe she is meeting with Hendricks, and vice versa, when in fact they are interacting with the IMF team. Moreau discovers the deception, and in the ensuing chaos, Hendricks manages to escape with the launch codes, losing Hunt's pursuit in the midst of a dust storm. As Moreau tries to escape, she is knocked out of a window by Carter and presumably falls to her death. Brandt accuses Carter of letting her love for Hanaway compromise the mission, but Hunt recognizes that Brandt has also been keeping secrets from them, having shown combat skills atypical of a mere analyst. Hunt leaves to meet with Bogdan to get more information on Hendricks, while Brandt tells the others that he had been assigned to secretly protect Ethan and his wife Julia in Croatia. Julia had been killed by a hit squad and Brandt feels responsible for Ethan's loss, which is why he stopped being a field agent. Bogdan directs Ethan towards Mumbai, where Hendricks is set to negotiate with Indian telecommunications entrepreneur Brij Nath to gain control of an obsolete Soviet military satellite. The IMF team splits up to stop Hendricks; Carter seduces Nath to get the satellite override code, while Hunt, Brandt and Dunn try to stop Hendricks from using Nath's broadcast station. They are too late as Hendricks has sent the launch codes to a Russian Delta III-class nuclear submarine to fire a single missile at San Francisco and disabled the station's computer systems. Brandt and Dunn race to get the systems back online to send the override code, while Hunt pursues Hendricks, eventually having a brutal brawl with him face to face in an automated car park. Hendricks, with the launch device, jumps to his death moments before the missile is set to land. Hunt then uses one of the cars and takes a dangerous fall to use the device; he barely disables the missile before it strikes. Sidorov, who has followed IMF from Dubai to Mumbai, arrives and realizes that the IMF is innocent of the Kremlin bombing. The team meets in Seattle after Ethan accepts a new mission from Luther Stickell. Brandt confesses to Ethan about his failure to protect Julia. Ethan, however, reveals that her "death" and the murder of the Serbians were part of a plot to give her a new identity and enable Ethan to infiltrate the prison. A relieved Brandt happily accepts his mission, and becomes an agent once again. Meanwhile, Julia arrives at the harbor. Ethan and Julia gaze at each other from afar before Ethan departs for his next mission. Tom Wilkinson (uncredited) as IMF Secretary. Despite Mission: Impossible III earning less than its predecessors at the box office, its critical reception was much better than the second film and Paramount Pictures was keen on developing a fourth in the series. In August 2009, Josh Appelbaum and André Nemec were hired to write the film's screenplay. Because of other commitments, J. J. Abrams said that it was unlikely for him to return as director but made note that he will produce the film alongside Tom Cruise. By March 2010, director Brad Bird was in talks of directing the film with Cruise returning to star as Ethan Hunt. The film was originally announced with a working name of Mission: Impossible 4 and code-named "Aries" during early production. By August 2010, title considerations did not include the Mission: Impossible 4 name, and thought was given to omitting the specific term "Mission: Impossible", which Variety compared to Christopher Nolan's Batman sequel film The Dark Knight. In late October 2010, however, the title was confirmed as Mission: Impossible – Ghost Protocol. On Ghost Protocol I came in on the middle of the shoot to do a rewrite of the screenplay, though they had already started the movie. I had to communicate with the entire staff to determine what I could and couldn't change, what sets had been built or struck, what scenes I could or couldn't reshoot. I learned so much about production being right there. ... The script had these fantastic sequences in it but there was a mystery in it that was very complicated. What I did was about clarity. The mystery had to be made simpler. It's like reaching into a sock and pulling it inside out. It's still a sock, still all the same pieces, but all put together in a different order. The film was partially shot with IMAX cameras, which made up approximately 30 minutes of the film's run time. Bird insisted that certain scenes of the film be shot in IMAX, as opposed to 3D, as he felt that the IMAX format offered the viewer more immersion due to its brighter, higher quality image, which is projected on a larger screen, without the need for specialised glasses. Bird also believed that the IMAX format would bring back "a level of showmanship" to the presentation of Hollywood films, which he believes the industry has lost due to its emphasis on screening films in multiplexes as opposed to grand theaters, and vetoing "first runs" in favor of wider initial releases. "When we were first looking at the image of Tom climbing the Burj, in the long shots we could not only see the traffic in the reflections when he presses down on the glass ... But you actually saw the glass warp slightly because of the pressure of his hand. You would never see that in 35mm. The fact that the screen fills your vision and is super sharp seems more life-like." —Brad Bird describing the advantages of filming in the IMAX format. Principal photography took place from October 2010 to March 19, 2011. Filming took place in Budapest, Mumbai, Prague, Moscow, Vancouver, Bangalore, and Dubai. Tom Cruise performed a sequence where Ethan Hunt scales the outside of the Burj Khalifa tower, which is the world's tallest building, without the use of a stunt double. Although Cruise appears to be free solo climbing in the film with the help of special gloves, in reality, he was securely attached to the Burj Khalifa at all times by multiple cables. Industrial Light & Magic digitally erased the cables in post-production. Following Cruise's example, Patton and Seydoux also chose to forgo the use of stunt doubles for their fight scene at the Burj Khalifa where Carter exacts her revenge upon Moreau for Hanaway's death. Many of the film's interior scenes were shot at Vancouver's Canadian Motion Picture Park Studios, including a key transition scene in a specially equipped IMF train car and the fight between Hunt and Hendricks in a Mumbai automated multi-level parking garage (which was constructed over a six-month period just for the film). The film's climax scene was shot with Indian film actor Anil Kapoor in the Sun Network office in Bangalore. The film's opening Moscow prison escape scenes were shot on location in a real former prison near Prague. Bird, having directed several Disney and Pixar films and short films, incorporated the trademark "A113" into the film on two separate occasions. The first is the design print on Hanaway's ring during the flashback sequence, and the second being when Hunt calls in for support and uses the drop callsign, Alpha 1-1-3. The musical score for Ghost Protocol was composed by Michael Giacchino, who also composed the music for the third film and collaborated with Bird on The Incredibles and Ratatouille. As in previous installments, the score incorporates Lalo Schifrin's themes from the original television series. "Lalo is an amazing jazz writer. You know you can't write a straight-up jazz score for a film like this but you can certainly hint at it here and there," said Giacchino, explaining the stylistic influence generated by Schifrin's history with the franchise. A soundtrack album was released by Varèse Sarabande on January 10, 2012. Tom Cruise along with Anil Kapoor at the Taj Mahal for the film promotion. In July 2011, a teaser trailer for Ghost Protocol was released illustrating new shots from the film, one of which being Tom Cruise scaling the world's tallest building, the Burj Khalifa building in Dubai. Moreover, prior to its release, the studio presented IMAX footage of the film to an invitation-only crowd of opinion makers and journalists at central London's BFI IMAX theater. One of the many scenes that were included was a chase scene in a Dubai desert sandstorm. During November 2011, the Paramount released a Facebook game of the film in order to promote it. The new game allowed players to choose the roles of IMF agents and assemble teams to embark on a multiplayer journey. Players were also able to garner tickets to the film's U.S. premiere and a hometown screening of the film for 30 friends. Following the world premiere in Dubai on December 7, 2011, the film was released in IMAX and other large-format theaters in the U.S. on December 16, 2011, with general release on December 21, 2011. Mission: Impossible – Ghost Protocol was released on DVD, Blu-ray, and digital download on April 17, 2012. The home media releases, however, do not preserve the original IMAX imagery, and its aspect ratio is consistently cropped to 2.40:1 rather than switching to a 1.78:1 aspect ratio during the IMAX scenes. Blu-ray Disc releases such as The Dark Knight, Tron: Legacy, and Transformers: Revenge of the Fallen will switch between 2.40:1 for regular scenes and 1.78:1 for IMAX scenes. The film was released on 4K UHD Blu-Ray on June 26, 2018. On Rotten Tomatoes, the film has an approval rating of 93% based on 238 reviews and an average rating of 7.7/10, making it the second best-reviewed entry of the series. The site's critical consensus reads, "Stylish, fast-paced, and loaded with gripping set pieces, the fourth Mission: Impossible is big-budget popcorn entertainment that really works." Metacritic assigned the film a score of 73 out of 100 based on 47 critics, indicating "generally favorable reviews". Roger Ebert of the Chicago Sun-Times gave the film 3.5 out of four stars, saying the film "is a terrific thriller with action sequences that function as a kind of action poetry". Stephen Whitty of The Star-Ledger wrote "The eye-candy—from high-tech gadgets to gorgeous people—has only been ratcheted up. And so has the excitement." He also gave the film 3.5 out of four stars. Giving the film three out of four stars, Wesley Morris of The Boston Globe said "In its way, the movie has old-Hollywood elegance. The scope and sets are vast, tall, and cavernous, but Bird scales down for spatial intimacy." Philippa Hawker of The Sydney Morning Herald gave the film three stars out of five and said it is "ludicrously improbable, but also quite fun." Owen Gleiberman of Entertainment Weekly opined that the movie "brims with scenes that are exciting and amazing at the same time; they're brought off with such casual aplomb that they're funny, too. ... Ghost Protocol is fast and explosive, but it's also a supremely clever sleight-of-hand thriller. Brad Bird, the animation wizard, ... showing an animator's miraculously precise use of visual space, has a playful, screw-tightening ingenuity all his own." Roger Moore of The Charlotte Observer gave the film three out of four stars; said "Brad Bird passes his audition for a career as a live-action director. And Ghost Protocol more than makes its bones as an argument for why Tom Cruise should continue in this role as long as his knees, and his nerves, hold up." Ghost Protocol grossed $209.4 million in North America and $485.3 million in other countries for a worldwide total of $694.7 million. It is the second highest-grossing film worldwide in the Mission: Impossible series, and the fifth highest-grossing film of 2011. It is also the second highest-grossing film worldwide starring Cruise, surpassing War of the Worlds from the top spot. It was the franchise's highest-grossing film and Cruise's biggest film at the time of release, before being surpassed by Mission: Impossible – Fallout seven years later. In limited release at 425 locations in North America, it earned $12.8 million over its opening weekend. After five days of limited release, it expanded to 3,448 theaters on its sixth day and reached #1 at the box office with $8.92 million. The film reached the top stop at the box office in its second and third weekends with $29.6 million and $29.4 million respectively. Though only 9% of the film's screenings were in IMAX theaters, they accounted for 23% of the film's box office. Outside North America, it debuted to a $69.5 million in 42 markets representing approximately 70% of the marketplace. In the United Arab Emirates, it set an opening-weekend record of $2.4 million (since surpassed by Marvel's The Avengers). In two countries outside the U.S. in which filming took place, its opening weekend gross increased by multiples over the previous installment: in Russia, more than doubling, to $6.08 million and in India, more than quadrupling, to $4.0 million. It is the second highest-grossing Mission: Impossible film outside North America. It topped the box office outside North America for three consecutive weekends (during December 2011) and five weekends in total (the other two in 2012). Its highest-grossing markets after North America are China ($102.5 million), Japan ($69.7 million), and South Korea ($51.1 million). In December 2011, Pegg suggested that he and Cruise were interested in returning for a fifth Mission: Impossible film. Paramount was also reportedly interested in fast-tracking a fifth film due to the fourth film's success. Bird had stated that he probably would not return to direct a fifth film, but Tom Cruise had been confirmed to return. It was revealed in August 2013 that Christopher McQuarrie would be the director of Mission: Impossible 5. Principal photography began in February 2014 in London. Paramount Pictures released the film on July 31, 2015. The plot centers around Hunt's IMF team in conflict with "the Syndicate", an international criminal organization first mentioned at the end of Ghost Protocol. ^ a b c d "Mission: Impossible - Ghost Protocol". American Film Institute. Retrieved February 18, 2017. ^ "MISSION: IMPOSSIBLE – GHOST PROTOCOL (4K UHD REVIEW)". The Digital Bits. Jun 25, 2018. Retrieved August 2, 2018. ^ "MISSION: IMPOSSIBLE - GHOST PROTOCOL (12A)". British Board of Film Classification. December 7, 2011. Retrieved August 2, 2015. ^ a b "Mission:Impossible – Ghost Protocol Box Office Data". Box Office Mojo. Retrieved March 15, 2012. ^ Peter Sciretta (May 7, 2010). "Brad Bird Confirmed for Mission: Impossible 4". /Film. Retrieved September 28, 2010. ^ "Box office collections of "Mission: Impossible" films". Retrieved March 3, 2013. ^ "'Mission: Impossible 4' Becomes Tom Cruise's Top-Grossing Film". Retrieved March 3, 2013. ^ "Tom Cruise's Top 10 Highest Grossing Films Of All Time". Retrieved March 3, 2013. ^ "Around-the-World Roundup: 'M:I-4' Passes $600 Million Worldwide". Retrieved March 3, 2013. ^ a b c "Mission: Impossible Ghost Protocol (2011)". Rotten Tomatoes. Retrieved June 20, 2012. ^ Dargis, Manohla (December 15, 2011). "Movie Review: Mission: Impossible — Ghost Protocol: Falling Off Skyscrapers Sometimes Hurts a Bit". The New York Times. Retrieved May 10, 2015. ^ Lin, Kristian (December 14, 2011). "Film Shorts > Opening: Mission: Impossible — Ghost Protocol". Fort Worth Weekly. Texas. Archived from the original on December 15, 2012. Retrieved May 10, 2015. ^ Harmsworth, Andrei (April 30, 2008). "Cruise sets out on new mission". Metro. DMG Media. Archived from the original on June 28, 2015. Retrieved August 1, 2015. ^ Fleming, Michael (August 6, 2009). "'Mission Impossible 4′ recruits scribes". Variety. Penske Media Corporation. Archived from the original on August 1, 2015. Retrieved August 1, 2015. ^ Ditzian, Eric (October 26, 2009). "J.J. Abrams Isn't Planning To Direct 'Mission: Impossible IV'". MTV News. MTV. Archived from the original on August 1, 2015. Retrieved August 1, 2015. ^ "'Incredibles' helmer on 'Mission: Impossible IV' list (exclusive)". The Hollywood Reporter. Prometheus Global Media. March 24, 2010. Archived from the original on March 28, 2010. Retrieved August 1, 2015. ^ Cinematical Staff (September 17, 2010). "Everything We Know About the Movie Not Called 'Mission: Impossible IV'". Cinematical. Retrieved September 28, 2010. ^ McClintock, Pamela (August 26, 2010). "Inside Par's 'Mission' revamp: No title yet for next pic in franchise; Renner signs". Variety. Archived from the original on November 22, 2011. ^ Fleming Jr, Mike. "New 'Mission: Impossible' Title Revealed". Deadline Hollywood. Penske Media Corporation. Archived from the original on August 1, 2015. Retrieved August 1, 2015. ^ Covert, Colin (December 25, 2012). "Writer-director McQuarrie is an over-'Reacher'". Star Tribune. Minneapolis, Minnesota. Archived from the original on June 9, 2017. Retrieved June 9, 2017. ^ "Paramount Pictures and IMAX Pact for Four Films in 2011". IMAX press release via Giant Screen Cinema Association. January 10, 2011. Archived from the original on December 18, 2011. Retrieved January 18, 2011. ^ "Mission Impossible' To Open Early On IMAX". Paramount Pictures press release via Deadline Hollywood. October 5, 2011. Retrieved October 27, 2011. ^ a b "Brad Bird: 'Mission: Impossible' opening early at IMAX". Indiewire. September 28, 2011. Retrieved October 27, 2011. ^ Desowitz, Bill (October 27, 2011). "Brad Bird Talks Mission: Impossible Ghost Protocol: IMAX vs. 3-D, Animation vs. Live Action, Trailer". Indiewire.com. Archived from the original on December 18, 2011. Retrieved December 3, 2011. ^ a b c d e "Mission Impossible – Ghost Protocol Production Notes". Paramount Pictures. Archived from the original on December 18, 2011. Retrieved November 24, 2011. ^ Russ Fischer (September 28, 2010). "Josh Holloway Joins Fourth 'Mission: Impossible'". /Film. Retrieved September 28, 2010. ^ ""Mission Impossible 4" called "Ghost Protocol": Cruise". Reuters. October 28, 2010. ^ "Mission Impossible 4 shooting in Mumbai!". The Times of India. April 25, 2011. Retrieved April 25, 2011. ^ "Sitting on top of the world! Is that Tom Cruise performing a death-defying stunt on the planet's highest skyscraper?". Daily Mail. UK. November 25, 2010. Retrieved October 27, 2011. ^ "Mission Impossible climax at Sun Network campus". IndiaGlitz.com. December 22, 2011. Archived from the original on August 1, 2015. Retrieved August 1, 2015. ^ "Mission Impossible 4 shooting in Mumbai!". The Times Of India. April 25, 2011. ^ "26- Mission Impossible: Ghost Protocol". Big Cartoon News. The Big Cartoon DataBase. Archived from the original on June 21, 2014. Retrieved August 1, 2015. ^ "'Mission: Impossible – Ghost Protocol' Soundtrack Details". Film Music Reporter. December 7, 2011. Archived from the original on January 5, 2012. Retrieved August 1, 2015. ^ "TOP SECRET! Agent ScoreKeeper Interrogates Michael Giacchino About His Score For MISSION: IMPOSSIBLE - GHOST PROTOCOL!!". Ain't It Cool News. January 3, 2012. Archived from the original on January 8, 2012. Retrieved August 1, 2015. ^ "Mission: Impossible - Ghost Protocol". Varèse Sarabande. Archived from the original on June 2, 2012. Retrieved August 1, 2015. ^ "'Mission Impossible: Ghost Protocol' Trailer Hits Web". Hollywood Reporter. June 28, 2011. Retrieved December 30, 2011. ^ Kemp, Stuart (November 18, 2011). "Paramount Pictures U.K. Shows IMAX Footage for 'Mission Impossible – Ghost Protocol'". Hollywood Reporter. Retrieved December 30, 2011. ^ Gaudiosi, John (November 21, 2011). "Paramount Pictures Launches 'Mission: Impossible' Facebook Game to Promote 'Ghost Protocol'". Hollywood Reporter. Retrieved December 30, 2011. ^ "Mission: Impossible – Ghost Protocol to open 8th Dubai International Film Festival". Dubai International Film Festival. November 14, 2011. Archived from the original on December 17, 2011. ^ McClintock, Pamela (September 28, 2011). "Paramount Opening 'Mission: Impossible – Ghost Protocol' Five Days Early in Imax". The Hollywood Reporter. Retrieved October 3, 2011. ^ Mission: Impossible – Ghost Protocol DVD RELEASE date | Redbox | Amazon | iTunes. Kuzleem.com. ^ Mission: Impossible – Ghost Protocol Blu-ray. Blu-ray.com. ^ Mission: Impossible – Ghost Protocol Blu-ray: Limited 3-Disc Combo Best Buy Exclusive Content. Blu-ray.com. ^ The Dark Knight Blu-ray. Blu-ray.com. ^ TRON: Legacy 3D Blu-ray. Blu-ray.com. ^ Transformers: Revenge of the Fallen Blu-ray: Two-Disc Special Edition | IMAX Edition, Wal-Mart Exclusive. Blu-ray.com. ^ Hunt, Bill. "Early Man, Game Night, your first look at Mission: Impossible 4K art, Kino's Maze 3D & a new Talking Blu". Retrieved 2018-04-26. ^ "Mission: Impossible – Ghost Protocol Reviews, Ratings, Credits, and More at Metacritic". Metacritic. Retrieved December 31, 2011. ^ Ebert, Roger (December 14, 2011). "Mission: Impossible – Ghost Protocol". Chicago Sun-Times. Chicago, Illinois, US. Retrieved December 15, 2011. ^ "Newest 'Mission' might make Cruise's series better than Bond's". Retrieved 20 June 2012. ^ Hawker, Philippa (December 15, 2011). "Mission: Impossible – Ghost Protocol". The Sydney Morning Herald. Sydney, Australia. Retrieved December 15, 2011. ^ Gleiberman, Owen (December 16, 2011). "Movie Review: Mission: Impossible – Ghost Protocol (2011)". Entertainment Weekly. Archived from the original on December 17, 2011. ^ "Movie Review: Mission: Impossible – Ghost Protocol". Retrieved 20 June 2012. ^ "Mission: Impossible – Franchise". Box Office Mojo. Retrieved January 10, 2012. ^ "2011 WORLDWIDE GROSSES". Retrieved April 8, 2012. ^ a b Subers, Ray (February 7, 2012). "Around-the-World Roundup: 'M:I-4' Passes $600 Million Worldwide". Box Office Mojo. Retrieved February 13, 2012. ^ "Weekend Report: Disappointing Debuts From 'Sherlock,' 'Alvin' Sequels". Box Office Mojo. Retrieved December 20, 2011. ^ Christmas Preview: 'M:I-4,' 'Dragon Tattoo' to Lead Crowded Holiday. Boxofficemojo.com (December 22, 2011). ^ Box Office: December 23–25, 2011. Boxofficemojo.com. ^ Box Office: December 30 – January 1, 2012. Boxofficemojo.com. ^ "IMAX Is on Cruise Control". Daily Finance. January 4, 2012. Retrieved January 12, 2012. ^ Finke, Nikki (May 7, 2012). "Avenger Actuals: $654.8M Weekend = $207.4M Record Domestic, $447.4M Foreign". Deadline Hollywood. Archived from the original on May 9, 2012. ^ Russia – CIS Box Office December 15–18, 2011. Boxofficemojo.com. ^ Subers, Ray. "Around-the-World Roundup: 'M:I-4' Lights Fuse Overseas". Box Office Mojo. Retrieved December 21, 2011. ^ Subers, Ray (January 22, 2012). "Around-the-World Roundup: 'Sherlock' Outwits Competition for Third-Straight Weekend". Box Office Mojo. Retrieved January 23, 2012. ^ Subers, Ray (January 4, 2012). "Around-the-World Roundup: 'Mission' Accomplished Again". Box Office Mojo. Retrieved March 12, 2012. ^ "China Weekly Box Office (Mar 19 – 25): John Carter repeat on a quiet weekend for openers". Box Office Follower. March 28, 2012. Retrieved March 29, 2012. ^ "MISSION: IMPOSSIBLE – GHOST PROTOCOL". Box Office Mojo. Retrieved February 23, 2012. ^ "Alliance of Women Film Journalists Awards 2011". Movie City News. ^ "Alliance of Women Film Journalists Awards 2011 winners". AWFJ.org. ^ "2011 Golden Reel Awards nominations". The Award Circuit. ^ Ford, Rachel (June 3, 2012). "MTV Movie Awards: Complete Winners List". Hollywood Reporter. Prometheus Global Media. Archived from the original on June 4, 2012. Retrieved June 4, 2012. ^ "First Wave of "Teen Choice 2012" Nominees Announced" (PDF). Teen Choice Awards. May 18, 2012. Archived from the original (PDF) on May 18, 2012. Retrieved May 18, 2012. ^ "TOLDJA: Christopher McQuarried Confirmed To Helm 'Mission: Impossible 5′". Deadline Hollywood. Penske Media Corporation. August 5, 2013. Retrieved October 30, 2013. ^ Chitwood, Adam (October 30, 2013). "Christopher McQuarrie to Direct Sci-Fi Anime Adaptation STAR BLAZERS; Filming on MISSION: IMPOSSIBLE 5 Begins February 2014". Collider.com. Retrieved October 30, 2013. ^ The Deadline Team (November 13, 2013). "'Mission: Impossible 5′ Gets Christmas 2015 Date". Deadline Hollywood. Retrieved December 25, 2013. Wikimedia Commons has media related to Mission: Impossible – Ghost Protocol. This page was last edited on 15 April 2019, at 01:07 (UTC).